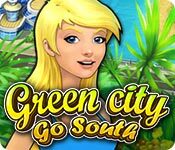 Green City: Go South is rated 4.1 out of 5 by 17. Rated 5 out of 5 by pennmom36 from Green Or Just Greedy? 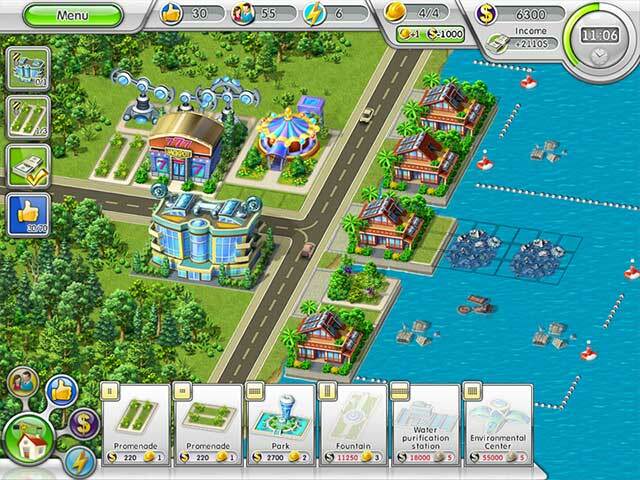 Green City is a really fun and entertaining game that requires you to meet certain goals such as building 3 cottages, earning 500 dollars profit and building up the prestige of the neighborhood. 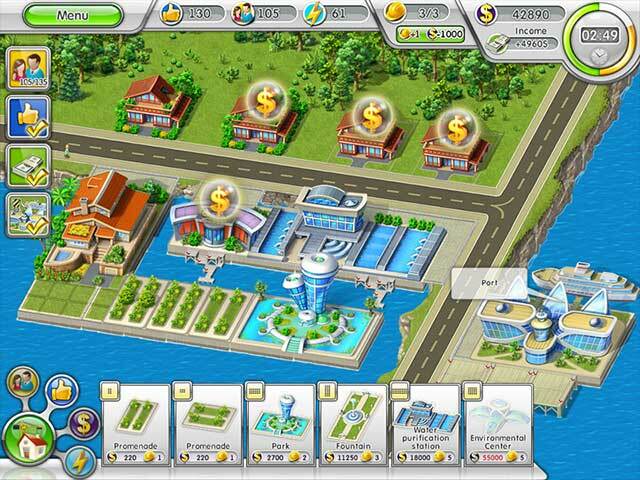 There are several different houses that are available and eventually you will unlock Power Plants and Commercial Buildings, there are also Gardens and Parks available that will perk up the neighborhoods as well make those locations more desirable which will bring in more money from the surrounding houses. Some of the plots for houses are on lakes which means that you will have to build platforms first, each building and gardens will require a specific amount of plot so you need to plan for that when required to build more than one specific building because a house takes a 3x3 plot but a cottage requires a 4x4 plot. You will have to tear down abandoned buildings, repair aging houses and pick up trash in the surrounding areas, and there will be a treasure chest that appears periodically and if you click on it before it disappears you will earn more money, enjoy! Rated 5 out of 5 by cleep100 from One of the Most Frustrating and Satisfying TM Games You'll Ever Play This third in the series is the best one yet. But beware...the Green City games are not easy. You have to lay things out in a particular order to even complete some levels, much less get gold. But if you keep at it, you will get better as you go and you'll really start to feel the satisfaction that comes from solving the level and beating the clock. The Tips Forum is extremely helpful for the tough ones. And you can find videos that show how to get gold on every level. Personally, I enjoy trying to solve it myself, with as little help as possible. But sometimes you really need a tip on getting started or on what buildings should go where. When I finally achieved gold on every level, I felt great! And since it's not easy, this game will provide many, many hours of challenging play. So it's a great value for the money, compared to a lot of other games, which are too easy or only take a few hours to finish. I hope this series will continue for at least a couple more installments. Rated 5 out of 5 by minipal from Love this game! I loved this game so much I went back and purchased the two previous versions. The only suggestion I would like to make is to be able to admire your work when the level is completed. As soon as you meet all the required tasks, the score pops up and goes on to the next level. Even though it's nice to finish the level, I throw buildings and upgrades all over the place but would like to be able to go back and "pretty it up" after it's done. Also it would be nice to have something that takes up one square, like a bush or tree to fill up empty spaces. Otherwise it was so much fun! Rated 5 out of 5 by DrDavid from A fine strategy game This is the third in a series of Green City games which appears to be billed as a Time Management Game but is also a fine strategy game. It is not possible to play the game as untimed, but the only consequence of taking too long is the awarding of less than three stars. Since I intensely dislike timed games, I have made it my goal to achieve one star on all levels. I have occasionally slipped up and gotten more stars, but I don’t beat myself up for allowing it to happen. All finishers are awarded at least one star. I will admit that on level 37 I took over two hours and finally had to read the forum for a hint so that I could finish. The strategy for me is not speed, but trying to place the houses to conserve space and achieve the goals for that level. If that is pleasing to you, then this game is for you. By the way, the first two Green City games were similar. My one quibble with the play is that the instructions during the game on the first several levels cannot be turned off. When the lady says to do this, you have to, even if you know what you are doing and don’t want to do that right now. This is annoying, but hardly more than an annoyance. I bought the game and I want to play it as a strategy game and not as a Time Management Game, and it does let me. So if you, too, hate timed games, this one will work for you. Rated 5 out of 5 by LavenderLion from Nice addition to the Green City series I've got the other Green City games and this one follows the same format. But with new building types and an oceanside setting to keep it interesting. I played through the demo and really enjoyed it. You dont have to have played the other games to understand. The game provides instructions on the first few levels. And its a building game, so if you play this type of game at all you should not have any problems. 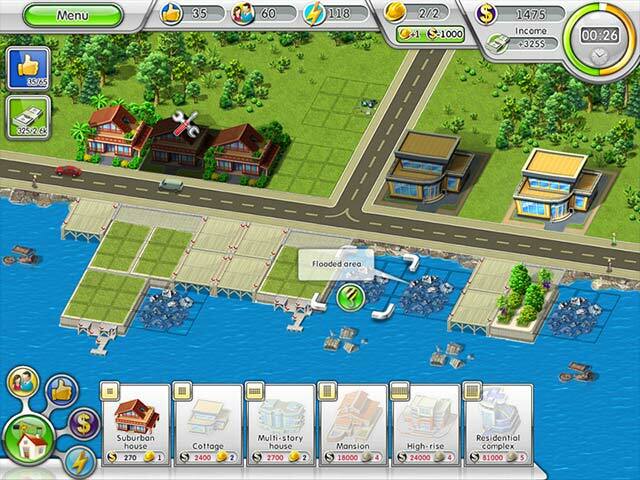 What's nice about the Green City games is the graphics, very 3D and colorful. And when you upgrade something it actually changes. :) The music is relaxing, sort of light jazz. So you can concentrate on the challenge of the game. And it is challenging. There are always multiple tasks: build so many buildings, have a specific income, own certain types of buildings and/or have a level of prestige (was eco in the earlier games). Each level has different requirements so its always interesting. You can get 1 to 3 starts for each level depending on how long it takes you. Usually easy on the early levels and much harder later. These Green City games really take planning and strategy to get through all the levels. There are awards also to add to the fun. Like one for using all the spaces available (which isnt really that easy). This will be a definite buy for me! Rated 5 out of 5 by trish999 from Great TM Game It's funny because I just finished re-playing Kingdom's Heyday (one of my fav's) which is very similar to this one. You build houses, cottages, multi-story buildings to achieve your goals. It is more of figuring out the strategy of where to put everything rather than a clickfest to get your gold stars. It is very fun and I recommend you give it a shot!! Rated 4 out of 5 by Cabbagepatcher from Just a Tad Too Difficult, but Good Value At last, a non HOG that's a bit different from the usual building games on offer. There is a lot of actual strategy in this, and no time limit for those who hate timed games. I didn't have any issues with the tutorial levels. It's pretty clear what your goals are, and I haven't previously played or trialled any Green City games. Now achieving those goals is a different matter. Judging from my own experience so far (level 26), and the number of "help for level X" threads in the forums, the difficulty level is set just a bit too high. However, the good part is that you can quit in the middle of the level if you're suffering from brain-fade, and it'll still all be there when you log in again, Graphics are generally good, but often a building can almost obscure the one behind it and it's sometimes hard to bring up the building or function that you want because of this. It looks like a long game, so you get your money's worth. I may go back and try the earlier ones.